Are you having trouble getting your kids or significant other to eat green food? If so, your big chance is coming up and I don’t want you to miss out. Instead of looking at St. Patrick’s Day as a day of corned beef and cabbage, artificially-dyed green bagels and Irish soda bread, it’s actually a huge opportunity to bust out the healthful greens. Why? 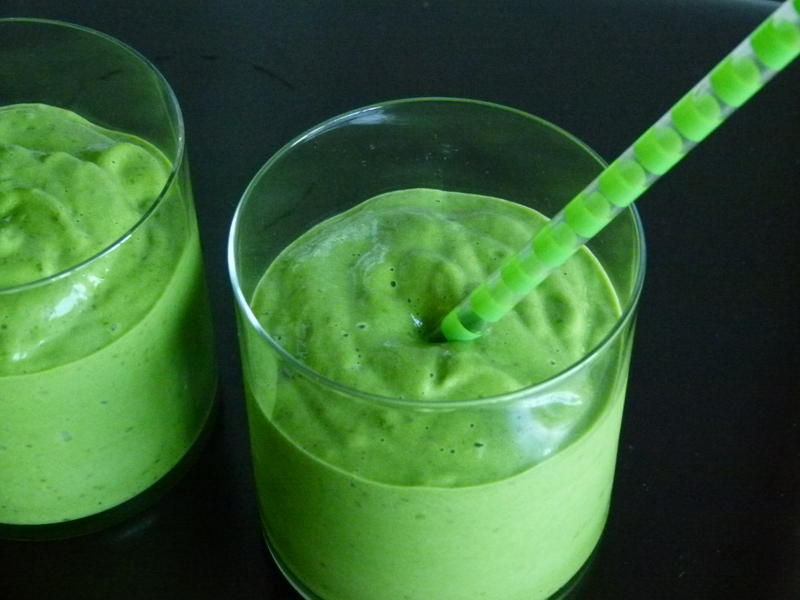 Because this holiday is all about green and it would be festive to serve green food. I’m not talking green-sprinkled sugar cookies, but Leprechaun Juice of course! 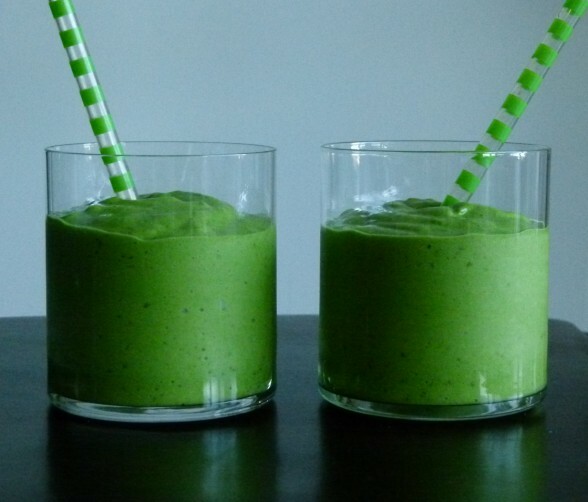 In fact, raw baby spinach gives give this drink its vibrant color as well as more nutrition than almost any food out there (think folate, antioxidants, Vitamins C and K, iron, magnesium and chlorophyll.) 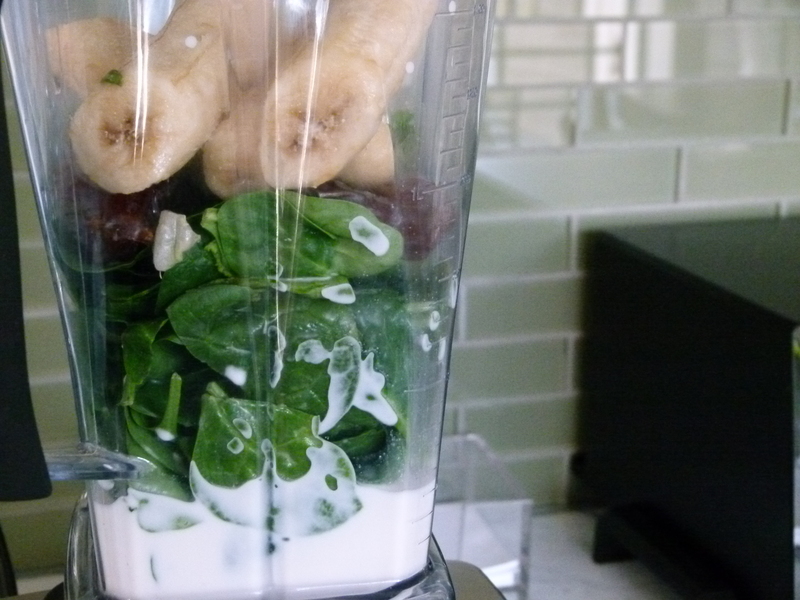 Spinach blends really well in smoothies because it’s tender and it doesn’t taste like spinach, especially when you toss some extra sweet bananas and dates in there. Dates and ripe bananas are my secret weapons when I want to use a natural sweetener. In fact, I buy several bunches of bananas at a time which I allow to ripen until they’re super sweet. I peel them and then keep them in the freezer for great smoothies, acai bowls and to dip in chocolate. You might be thinking the most unusual suspect here is probably the avocado. But its richness makes this smoothie as thick and creamy as a milkshake with absolutely no weird flavor. I am truly the president of the avocado fan club. They are full of fresh, high-quality fat, loads of Vitamin E and fiber. And it’s that fat that helps us absorb the fat soluble vitamins and antioxidants, especially the carotenoids in spinach. Mr. Picky has a cutie-pie friend that walks with us to school every Thursday morning. According to his mom, he rivals my son in pickiness. I don’t think she could have ever predicted that her son would be the one operating our juicer every Thursday morning and the first one to gulp down kale, apple and celery juice. She was really tickled when I sent her a photo of the two “picky boys” slurping their green shakes. One of the best things you can do is not to assume your kids or significant other won’t like something. Worst case scenario here is that if you have no takers for Leprechaun Juice, there will be more for you! If you have a high-powered blender, such as a Vita-Mix, place all the ingredients in the blender and process until smooth. If you do not have a high-powered blender, the dates may not get blended completely and may leave tiny little bits of date in the smoothie. If that bothers you, blend the almond milk and dates together and then strain the mixture. Add the remaining ingredients to the blender with the strained almond milk and blend until smooth. Or just use honey or maple syrup to sweeten instead of dates. I love this smoothie and have it several mornings a week. Any suggestions for making it a little more satiating for more of the morning? Maybe a protein powder that you would recommend that wouldn’t change the delicious flavor of the smoothie? Thank you for your great recipes! My husband is doing the biggest loser at work, this is all he’s doing, all day every day, he’s lost 9 pounds in 5 days… and he loves it! That’s awesome! Good luck to your hubby! This is delicious! After making it with cow’s milk the first couple of times, I’ve switched to mostly coconut milk. I also grind a couple tablespoons of flaxseed and toss it in. And, if I need a breakfast smoothie with a little extra protein, I throw in two raw eggs. You can’t tell they’re there. If the bananas aren’t as ripe as they should be for this, I add a couple drops of stevia extract. Yum! Such great suggestions, Bryan! Thank you so much! I just tried this one, and it was great!! I’m not a spinach fan normally, but it doesn’t taste like spinach. It was really cool and smooth – it seems like something that would hit the spot in the summer. I LOVE this! Was a little skeptical at first but this has now become my “weekend treat” – I always feel amazing afterwards. Great way to get those extra nutrients into my body without making it seem like a chore! Thanks, Pamela! I just got into making smoothies, and I LOVE them! This was such a wonderful way to get my greens in! I am a teacher, and my plan is to make this ahead of time, and leave in the fridge at my school to have at lunchtime. Hopefully, it will help me with my weightless! Thanks so much! I’m so inspired by your site! Thank you for all the fabulous healtful recipes! 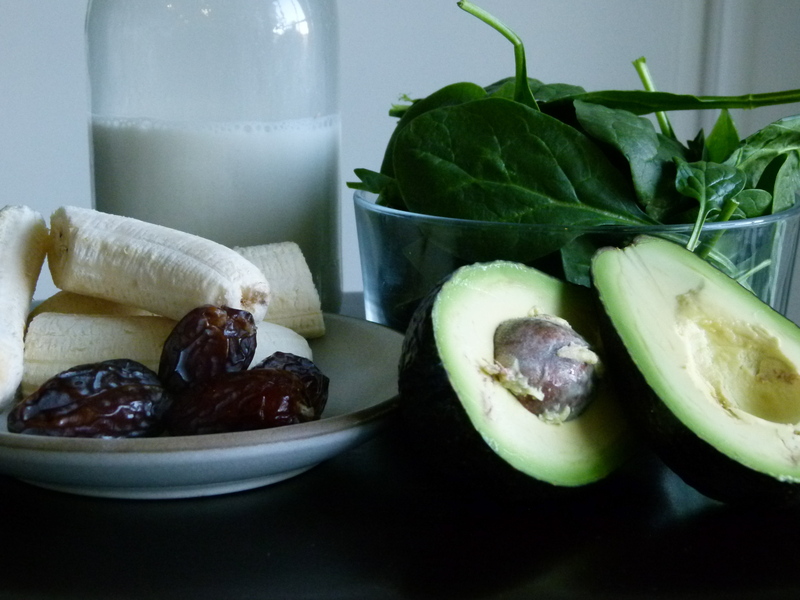 Smoothie is delish…can I sub banana for a different fruit?…don’t love the taste of bananas. Awww, thanks Jessica! I would sub frozen ripe pears (1st choice) or mango for the banana. Thanks Pamela! This drink is great… And I hate spinach!! What a good way to get in some greens!!! Delicious! WOW! Found this on the site last night, went shopping this morning for ingredients and am now enjoying a great drink. I made it this morning. Absolutely delicious. Just sweet enough and so creamy. I soaked the dates in the almond milk for 10 minutes to soften them up a bit. I used my hand blender and it came out perefect! Thanks so much for the recipe Pamela! my son who is almost 4 loved this yesterday. I made sure he didn’t see what was inside and he loved it so much he wanted to save some for the next day. When I told him what was in there he said “i don’t like spinach or avocados” and I said well apparently you do! i want to email you the photos! Awesome story!! I love hearing things like that 🙂 and love the pictures you sent even more. Priceless, adorable green mustache! Thank you! while we’re on the topic of green juice here – can you tell us which type of juicer you have? i’m thinking of buying one! thanks! I have the Omega 8003, which I think does a great job. Thanks for writing in, Sally Jo! Helps motivate the doubters ;). Haha!!! Really funny, thanks for sharing! So glad you liked it. Thanks for writing in, too! I found the recipe and it’s Sooooooo good! I’ve also added acouple tbspn of hemp seeds for some protein. I totally love this idea. I wasn’t a fan of dates until my mother bought me one of those awesome Larabar (tricksy, she is!) date-nut bars…yum!… and then I had no excuse. But I never considered using dates in smoothies. Bananas for sure, but this is definitely something I’ve got to try now! Do it! I am obsessed with dates — they’re my favorite sweetener. 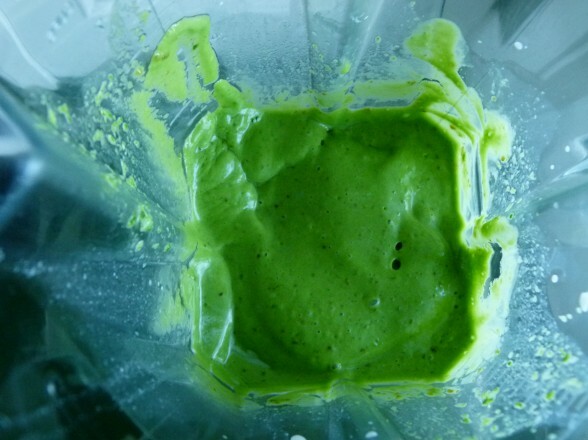 Again, if you don’t have a Vitamix, the dates may not get blended to smithereens. You can also try soaking them ahead to soften them up. Enjoy!